(TibetanReview.net, Jul16, 2014) –A locally prominent senior Tibetan Buddhist leader and non-governmental public figure continues to remain disappeared after being taken away by the Chinese police in Driru (Chinese: Biru) County of Nagchu Prefecture, Tibet Autonomous Region, on a Wednesday in May this year, said Dharamshala-based Tibetan centre for Human Rights and Democracy (TCHRD) in a report Jul 14. Wednesday is the birthday of Tibet’s exiled spiritual leader, the Dalai Lama. Tibetans have been marking it as Lhakar or the Auspicious Day since the 2008 brutal Chinese repression of their uprising protests. The day sees Tibetans making special efforts to preserve and promote their culture and linguistic heritage. The detainee, Tenzin Lhundup, was taken away while giving a lecture on the “situation of Tibetan language and nationality” to villagers of Shagchu (Xiaqu) Township. 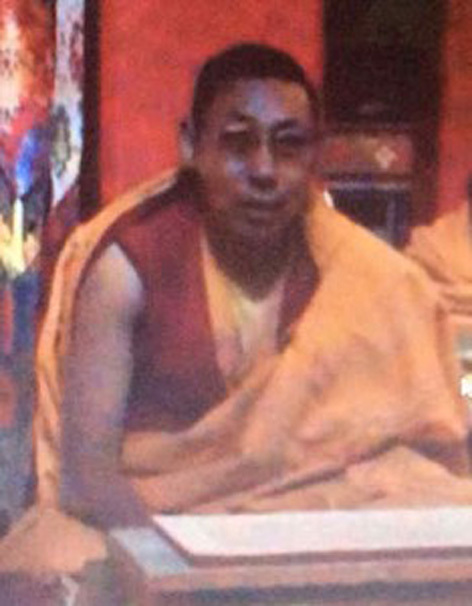 The TCHRD report said he was taken away from Gom Gonsar Monastery in the county’s Lenchu Township. The Chinese police are said to have accused the senior monk of being involved in many disturbances, including leading last year’s large-scale Tibetan protest against Chinese mining activities at a sacred site called Naglha Dzambha Mountain. While taking him away, the Chinese police were said to have surrounded the monastery and searched the living quarters of monks to look for items deemed as ‘promoting separatism’. Apart from giving Buddhist teachings to local Tibetans, Tenzin Lhundup was said to help arbitrate local disputes and advocate vegetarianism. He was said to regularly give speeches to local Tibetans, urging them to protect the sacred Naglha Dzambha Mountain from Chinese miners. These and his zealous advocacy of the preservation of Tibetan identity were said to have earned him hostility from the authorities. Later in June, the authorities were reported to have issued a notification, imposing severe new restrictions on the local Tibetans’ freedoms of movement, speech, and religion and warning of severe consequences for any violation of these restrictions. Religious teachers were warned against “spreading rumours.” Ordinary Tibetans were told that they would be banned from harvesting caterpillar fungus (Yartsa Gunbu) and their welfare entitlements cancelled if they sing in praise of Tibetan independence, speak against Chinese government policies, “leak state secrets to the outside world”, or listen to news broadcasts from media services linked to exile Tibetans. Communication lines, including the internet and telephone services, in the area remained cut off, the centre said.